Using a new technique called HARPES, a team of scientists look to uncover the origin of the ferromagnetism in dilute magnetic semiconductors. Spintronic technology, in which data is processed on the basis of electron “spin” rather than charge, promises to revolutionize the computing industry with smaller, faster and more energy efficient data storage and processing. Materials drawing a lot of attention for spintronic applications are dilute magnetic semiconductors – normal semiconductors to which a small amount of magnetic atoms is added to make them ferromagnetic. Understanding the source of ferromagnetism in dilute magnetic semiconductors has been a major road-block impeding their further development and use in spintronics. Now a significant step to removing this road-block has been taken. A multi-institutional collaboration of researchers led by scientists at the U.S. Department of Energy’s Lawrence Berkeley National Laboratory (Berkeley Lab), using a new technique called HARPES, for Hard x-ray Angle-Resolved PhotoEmission Spectroscopy, has investigated the bulk electronic structure of the prototypical dilute magnetic semiconductor gallium manganese arsenide. Their findings show that the material’s ferromagnetism arises from both of the two different mechanisms that have been proposed to explain it. 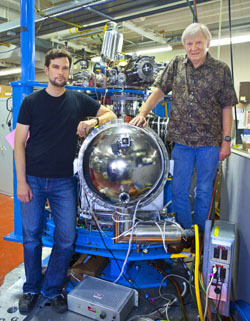 Fadley, who holds joint appointments with Berkeley Lab’s Materials Sciences Division and the University of California (UC) Davis where he is a Distinguished Professor of Physics, is the senior author of a paper describing this work in the journal Nature Materials. The paper is titled “Bulk electronic structure of the dilute magnetic semiconductor GaMnAs through hard X-ray angle-resolved photoemission.” The lead and corresponding author is Alexander Gray, formerly with Fadley’s research group and now with the Stanford University and the SLAC National Accelerator Laboratory. For the semiconductors used in today’s computers, tablets and smart phones, etc., once a device is fabricated it is the electronic structures below the surface, in the bulk of the material or in buried layers, that determine its effectiveness. 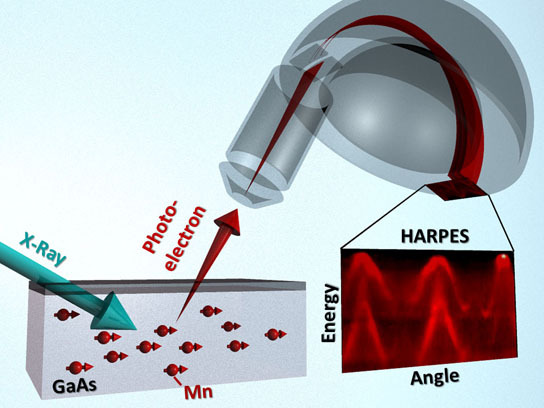 HARPES, which is based on the photoelectric effect described in 1905 by Albert Einstein, enables scientists to study bulk electronic effects with minimum interference from surface reactions or contamination. It also allows them to probe buried layers and interfaces that are ubiquitous in nanoscale devices, and are key to smaller logic elements in electronics, novel memory architectures in spintronics, and more efficient energy conversion in photovoltaic cells. In this new study, Gray and Fadley and their collaborators, used HARPES to shed important new light on the electronic bulk structure of gallium manganese arsenide (GaMnAs). As a semiconductor, gallium arsenide is second only to silicon in widespread use and importance. If a few percent of the gallium atoms in this semiconductor are replaced with atoms of manganese the result is a dilute magnetic semiconductor. Such materials would be especially well-suited for further development into spintronic devices if the mechanisms behind their ferromagnetism were better understood. The two prevailing theories behind the origin of ferromagnetism in GaMnAs and other dilute magnetic semiconductors are the “p-d exchange model” and the “double exchange model.” According to the p-d exchange model, ferromagnetism is mediated by electrons residing in the valence bands of gallium arsenide whose influence extends through the material to other manganese atoms. The double exchange model holds that the magnetism-mediating electrons reside in a separate impurity band created by doping the gallium arsenide with manganese. These electrons in effect jump back and forth between two manganese atoms so as to lower their energy when their ferromagnetic magnets are parallel. Gray and Fadley conducted this study using a high intensity undulator beamline at the SPring8 synchrotron radiation facility in Hyogo, Japan, which is operated by the Japanese National Institute for Materials Sciences. New HARPES studies are now underway at Berkeley Lab’s Advanced Light Source (ALS) using the Multi-Technique Spectrometer/Diffractometer endstation at the hard x-ray photoemission beamline (9.3.1). Co-authoring the Nature Materials paper with Gray and Fadley were Jan Minár, Shigenori Ueda, Peter Stone, Yoshiyuki Yamashita, Jun Fujii, Juergen Braun, Lukasz Plucinski, Claus Schneider, Giancarlo Panaccione, Hubert Ebert, Oscar Dubon and Keisuke Kobayashi. Be the first to comment on "HARPES Technique Reveals Ferromagnetic Secrets of Dilute Magnetic Semiconductors"